Henry “Box” Brown’s ingenious escape from slavery is celebrated for its daring and originality. Throughout his life, Henry was fortified by music, family, and a dream of freedom. When he seemed to lose everything, he forged these elements into the song that sustained him through the careful planning and execution of his perilous journey to the North. 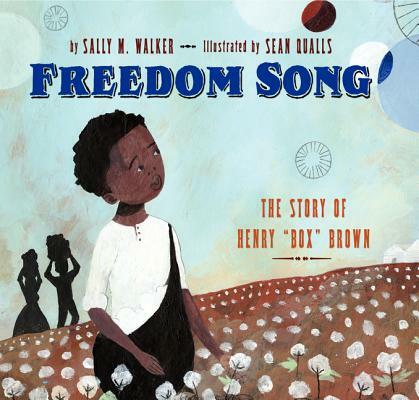 Honoring Henry’s determination and courage, Sibert Medal–winning author Sally M. Walker weaves a lyrical, moving story of the human spirit. And in nuanced illustrations, Sean Qualls captures the moments of strength, despair, and gratitude that highlight the remarkable story of a man determined to be free. Sally M. Walker’s many award-winning books bring history and science alive for young readers. Her books include the Robert F. Sibert Medal winner Secrets Of A Civil War Submarine: Solving the Mysteries of the H. L. Hunley and the Revolutionary War story The 18 Penny Goose (an I Can Read Book). Ms. Walker lives in DeKalb, Illinois. Sean Qualls is the Coretta Scott King Honor illustrator of Before John Was a Jazz Giant: A Song of John Coltrane , by Carole Boston Weatherford. His art appears in many children’s books, including Little Cloud and Lady Wind, by Toni Morrison and Slade Morrison, and Giant Steps to Change the World, by Spike Lee and Tonya Lewis Lee. Mr. Qualls lives in Brooklyn, NY. Qualls’s primitive-style collage illustrations strongly convey the depth of Brown’s emotions.